A teen’s fervent spiritual quest will reach a pinnacle at midnight Mass this Christmas, when Julia Carlone sidles up next to her grandma and participates in the Dec. 24 liturgy at All Saints in Lakeville for the first time as a fully initiated Catholic. It was a longtime dream sparked by her devout 75-year-old grandmother, Diane Spande, and inspired by her experience at the Convent of the Visitation School in Mendota Heights, where the 18-year-old from Lakeville is a senior. Carlone was baptized Catholic but raised Lutheran. Since arriving at “Vis” in seventh grade, Carlone began an earnest examination of the Catholicism permeating the school, particularly influenced by the Visitation sisters and religion teacher Mary McClure, Carlone’s sponsor. That epiphany took hold junior year, propelled by the richness of the faith and her desire to participate fully. She was also awed by the stories in “Extraordinary Ordinary Lives,” Elsa Thompson Hofmeister’s book on the Visitation sisters. McClure was instrumental in her journey toward confirmation, Carlone said, meeting regularly to field questions and facilitating a modified Rite of Christian Initiation of Adults program at nearby St. Joseph in West St. Paul that was adapted to complement her studies in religion class. As part of her RCIA preparation, Carlone also worked closely with school chaplain Father Mark Pavlak, associate pastor of St. John Neumann in Eagan. 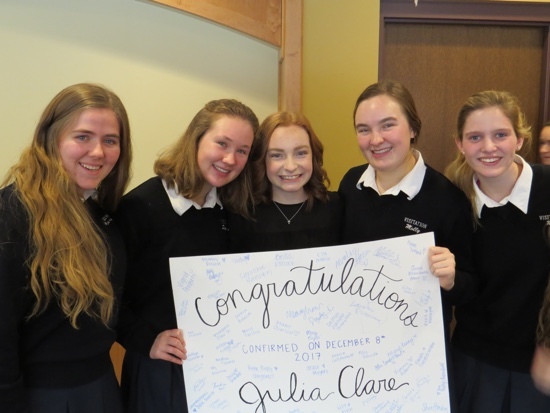 She made her official yes at a Dec. 8 all-school Mass, where she was the first among the assembled student body to receive holy Communion and was also confirmed. The arrangement was arrived at, with permission, because Carlone did not want to wait until Easter, the traditional time for RCIA candidates to enter the Church, and because it felt fitting to receive the sacraments at the place where her faith was cultivated. That faith is a powerful antidote to the stressors of adolescence, Carlone said, including her looming college decision. It also reminds her to resist the commercialism of Christmas. “I finally decided an Apple watch is not what I should be focusing on, and I’ve moved on from that,” she said. Her grandma, who taught her the rosary, had always dreamed of having her family take up a pew at midnight Mass. Over time, that vision became Carlone’s.